There is such delight to be had at the seashore when standing at the water’s edge, wiggling with excitement as the waves gently tickle your toes. This weed wave invites the same excitement, but you might need to be wary, for the tickles have sharp bits in them! The ocean waves froth and bubble as they bring up tiny treasures and spread them at your feet: a horseshoe crab, a pearly shell, and grains of sand to coat your skin. This weed wave has brought forth out of the sea of destruction, a group of similar vagabonds. The brown spiky burrs and husks of spent flowers that yield thorns shall burrow into the sandy ground like their seashore counterparts, the horseshoe crabs who swiftly wriggle and dig down into the wet sand. We can only wonder at what treasures both hope to find! The violet hued clown-hatted flowers have been pinked to sharp points for fierce effect like the undersea homes of ocean floor dwellers, who need protection from intruders. 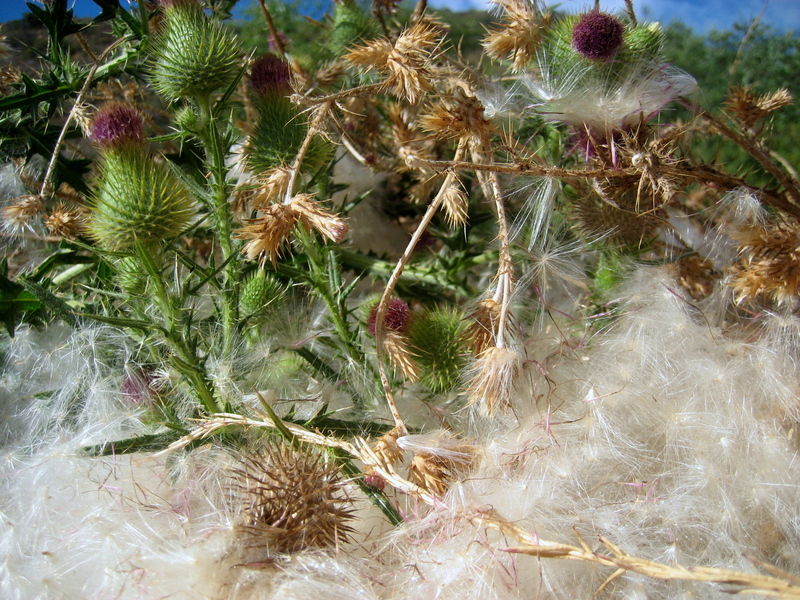 And in great bountiful puffs, this weed wave fluffs up promisingly with soft tufted thistle seeds akin to grains of sand lifted up by the frothy waves at the shore. Weed waves arch and break with exuberance and renewal, revealing the showy pivotal stages of the plant as they crash around us. In a matter of weeks, there will be a new tide of thistle plants to rework the bare land. Thank you Jane. Isn’t it delightful when a word can be loved? Thank you Aina for your visit and your trip with me to the sea of weeds. You are a lovely companion.